Sell your used books, your CD collection, DVD and Blu-ray collection as well as video games. Of course for the best price possible thanks to the free Bonavendi price comparison - we compare prices and find the best deal within seconds. Buy used books, CDs, DVDs, Blu-rays and video games for the best price. 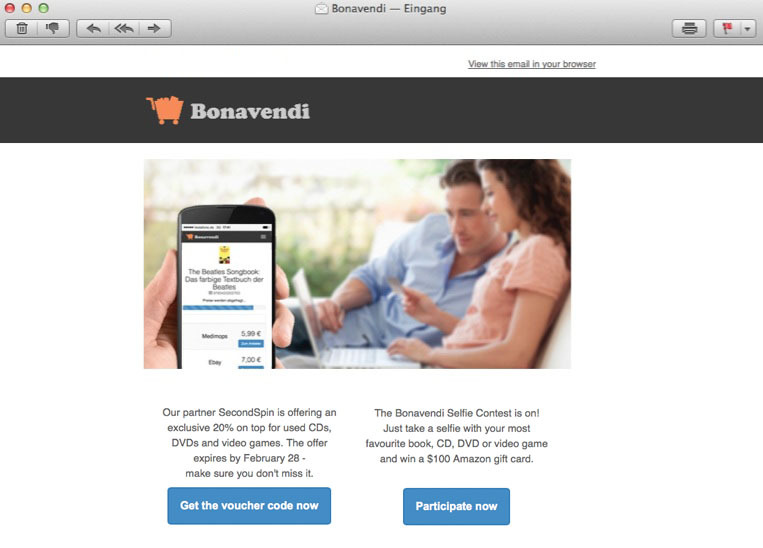 Save up to 50% with the free Bonavendi price comparison. Our explainer video showcases the features and benefits of Bonavendi in just two minutes. Check it out now! Whether you want to buy or sell used items - Bonavendi always finds the best price for you. Get more, pay less. 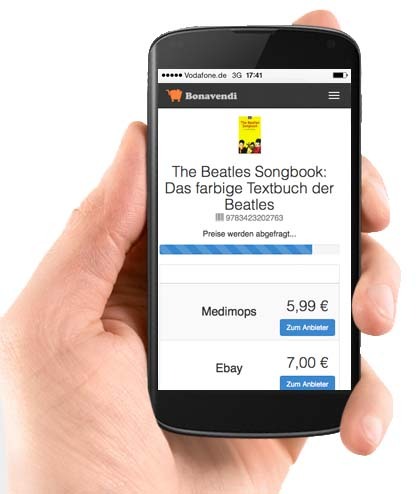 Bonavendi compares prices for used items online within seconds. That way, you have more time for the important things in life. 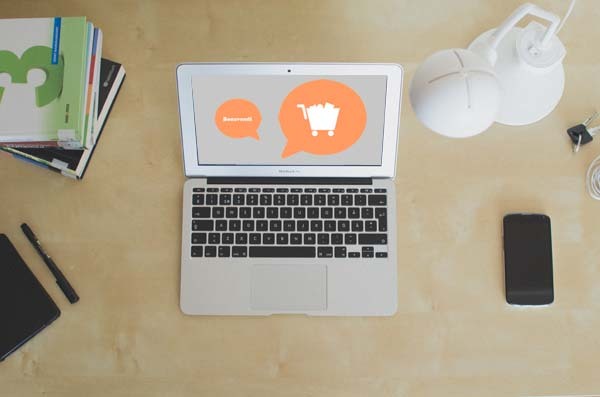 The Bonavendi shopping cart helps you stay on top of things even if you have a lot of items to sell or buy. It even comes up with optimized price suggestions. Reusing second hand items is not only good for your wallet, but also for the environment. Bonavendi is the largest price comparison site for used items in the US - considering over 30 vendor websites for buying and selling used stuff. The perfect add-on for all smartphone users: Grab your items, scan the barcodes, get the best prices, and easily sell all the items through the website using your PC or Mac. Get interesting news, promotions, special offers, and vouchers right into your inbox - for free! You are interested in special promotions, vouchers, and in general in saving money by selling and buying used items online? Follow us on Facebook, Twitter or Google+ and share our content with your friends. Bonavendi.com is a unique price comparison website: with a single click you can compare prices and buyback prices of used items on all the websites for buying and selling used stuff. It's a fast and simple price comparison - whether you want to sell at the best price possible or buy cheap used items, we will find used CDs, DVDs, cheap textbooks, half price books and even the latest video games for you. You don't want to wait until the next yard sale or the next flea market to get rid of your used stuff? Not knowing at what price your used items are going to be sold drives you mad? Bonavendi is the best alternative to eBay and other online auctions if you want to make money with used items and get instant cash for it. We provide you with fixed prices from the best buyback websites. If you're a student and you're looking for cheap textbooks or want to sell them you don't have to take care of different websites and worry about comparing prices, you sell back textbooks right here or find cheap books you need. You save money and time! Anyway it's not only used books you can buy and sell. We also compare prices of video games and movies. To make sure you find the cheapest Xbox 360 games and sell used video games at the highest price, simply rely on Bonavendi. Soon you will be able to sell your iPhone 5s to have more money for the latest iPad. So don't even think about throwing everything away to create some space at home, there's easy money to make! Forget about browsing the internet and spending your precious time on comparing prices. We do it for you! All you need to do is to decide which used items you want to sell and look out for used items you want to buy. Enjoy Bonavendi's free price comparison service. Buyback websites - what is that actually? Through buyback websites, you can sell your used items, e.g., books, CDs, DVDs, or computer games, easily and very conviniently. You can sell several items at once, for a pre-defined fixed price that the vendors tell you in advance on their website. After having sent the items to the vendors, you promptly get your cash. Online seconds hand shops - how does that work? Numerous internet shops offer used items at a signficiant discount over the original price. You easily save up to 50% and at the same time, you help protecting the environment. The items are in excellent conditions, practically as good as new. To make sure you buy at vendor with the lowest price, Bonavendi compares prices with a single click. Why should I compare prices for used items? Prices and conditions of the various buyback- and second hand websites differ dramatically. 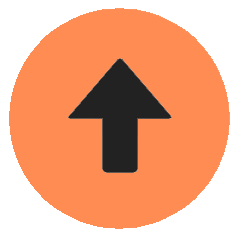 Bonavendi compares the prices of all vendors with a single click, so you save both time and money.